This title helps you discover the secrets of a culinary tradition characterized by subtle scents, delicate tastes and elegant presentation. 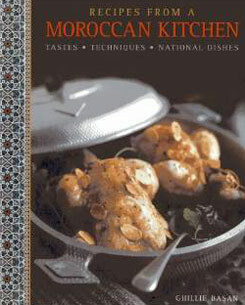 It offers full of tempting recipes that draw on the herbs and spices of the souk, the fresh ingredients of the countryside, and the traditions of the Moroccan kitchen. You can enjoy Casablancan Couscous with Roasted Summer Vegetables, Tagine of Lamb with Crunchy Country Salad, Sauteed Herb Salad with Chilli and Preserved Lemon, and Burnt Mulhalbia with Rose-Petal Jam. This beautifully photographed book is full of recipes that evoke the glorious tastes and textures of traditional Moroccan cooking – its exciting use of ingredients, its sweet and spicy combinations, its careful use of petals and flower waters – and places them in a modern context. You can discover tagines of chicken or lamb, enhanced by preserved lemons, prunes and olives. You can enjoy fresh, tangy salads such as Artichoke Hearts with Ginger and Honey, and delectable snacks such as Mini Saffron Fish Cakes. It includes drinks and rich desserts, such as Sweet Couscous with Rose-scented Fruit Compote. Every recipe is clearly explained, and an introduction describes all the ingredients and cooking techniques. Moroccans are well known for their love of wonderful food and generous hospitality, and this book will provide all the inspiration you need to follow their example.